Hey y’all, it’s jeans sewalong week! All week Sabra and I will be trading tips and tutorials to get you sewing your own jeans. 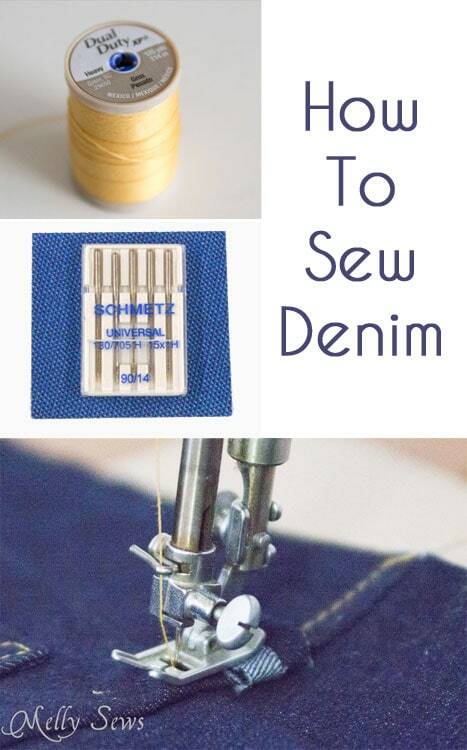 First up for me are tips to sew denim. Denim is one of those fabrics people avoid because it’s thick, which means that when you fold it or sew two pieces together it just gets thicker. But if you handle it correctly, sewing your own jeans is not that hard. Really. I promise – I sewed mine in an afternoon. Really that’s all there is to it. But let’s delve into each a little more in depth. Really, this one is kind of obvious. I mean, I’m not sure when, in sewing, you’d want dull scissors. So let’s move on. There are jeans needles that you can buy especially for sewing jeans. But I don’t use them. 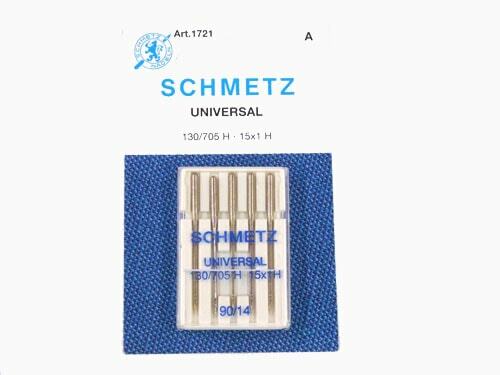 I just make sure to have at least a size 90/14 universal needle (100/16 for thicker denim) and all is well. Needles should be matched to the thickness of the fabric you’re sewing. Denim is at least a size 90. Voile? Well for that you’re going to want to go 80/12 or 70/11. Not so hard, right? 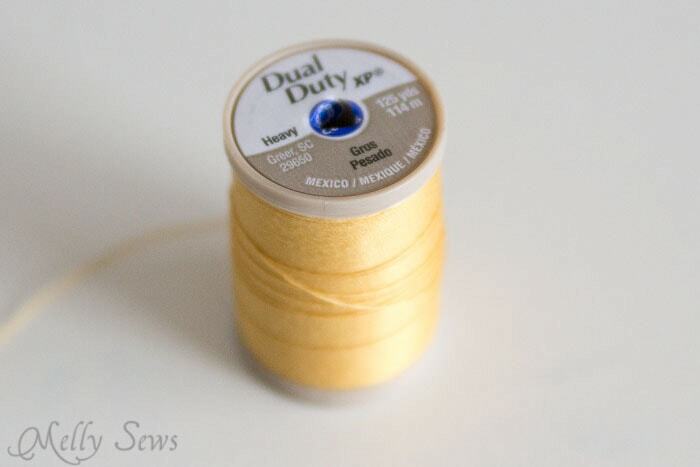 For the regular seams, I use all purpose thread. But for the topstitching that comes with flat felling, I switch to Heavy Duty thread. Tip: some sewing machines (my vintage one) hate the cotton thread that is marketed as jeans thread. My machine shreds this stuff. Upholstery thread can be a great substitute – it looks thicker like the topstitching thread you’re used to seeing on jeans, but it’s smoother than the cotton jeans thread, and so it is less prone to making your machine anger and shred it. I don’t actually even know that this is what it’s properly called, this is just what I call it. Basically a bumper is a scrap of denim you keep near your machine while sewing. 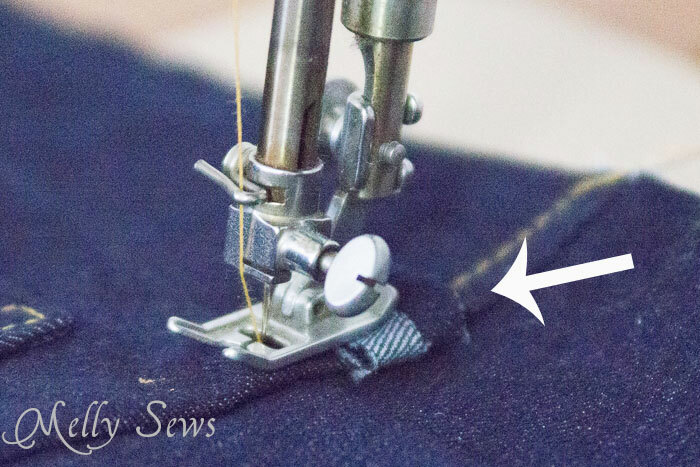 When you’re sewing over thick areas, like the place where the two seams cross at the back yoke, your machine might want to stall because of the presser foot being unbalanced. Bumper to the rescue! Fold it up, place it behind or in front of the presser foot to level the foot out and allow you to continue sewing. If you have a newer machine, it might have come with a J foot, also known as a leveling foot (affiliate link). The video below shows how to use that, and if you can’t watch it below you can also watch it on YouTube here. This, like sharp scissors, is kind of an obvious one. There are lots of places on the jeans where you might even want to handcrank the flywheel to get through. And that’s perfectly fine – it’s easier to slow down and do it right than to have to pull out the seam ripper and take out stitches. Head on over to Sew a Straight Line to find out her best tips for cutting out your pattern and transferring markings. it out. Its called a Jean a Ma Jig. They are 3.48 each! I have one of these, and it works great! Thanks for the advice on upholstery thread! I’ll try that! For me however, I work much better special denim needles even noticed my machine costing less work through the thick areas, even using small numbers. The machine is much smoother, and if we use above coarse thread, needles jeans have a special recess prevents skipped stitches .. I always use the needles jeans 130/705 H-J , even for sewing thick fabrics, when I want to use thick threads . You’re correct on the Denim Sharp needle. When you are sewing any fabric that is closely woven or even painted, you need the needle to pierce the fabric and make a “hole” that keeps the thread from being held tightly to the back of the needle. If that happens, your bobbin cannot catch the thread to make a stitch. Any time you have skipped stitches, check the size and type needle you are using. Universal needless tend to slide between the woven fibers of your fabric and may cause skipped stitches. There is so much more to share on this. Please contact me at msflair50 @gmail. com. I’ll be happy to answer your questions/concerns. Knowledge is power! My grandmother’s go-to with sewing denim was a bar of soap. In spots that are heavier, a little soap on the spot helps lubricate the needle, so it’s less stress on the needle and the machine. It kept her under-powered machine happy, in spite of the abuse we gave it with denim. I have never heard of a bumper either, I just lift the foot and turn the machine by hand until over the tough spot. It is called a “Hump Jumper” or “Jean-a-ma-jig”, usually has two “heights” or thicknesses – one on each end – and is placed behind the pressure foot to level it out so the feed dogs will do their job, continuing to move the fabric along despite the thickness of the offending seam. It could be moved to the front to continue once it has sewn over the thick seam to keep the presser foot from “falling off” the thick seam in the front. Since it has “toes” with an opening for the needle to pass through, sewing with it is a cinch! They are available at most sewing machine dealerships and through Nancy’s Notions. Well worth having in your sewing supplies. Sew smarter, not harder! I hem jeans for my clients, who are friends, family, and neighbors. The tool I use is called a Jean-a-ma-jig…it raises up the “downhill” side of my presser foot when I’m sewing over extra thick areas. I also bought a machine that has a stronger motor that can punch through things like canvas and denim, vinyl, and faux leather. I used to break many needles when hemming or mending jeans…now, not so much needle-breakage. Thanks! Glad I read this before I turn my daughters jeans into Capris. my Bernina 1080 came with a device called a height compensator. It’s 3 small strips of plastic riveted together so you can you can combine them for three different thickness. You place the compensator under the trailing edge of the presser foot at the denim seam and it glides smoothly over the seam. The plastic allows the presser foot to “slide” while it presses the denim down for a good bite against the feed dog. This is Bernina’s “bumper”. I started with Denim projects short ago and your tips are helping through this learning process. Thank you very much! You can hammer both the inseam and out seam of your jeans before hemming them. Both seams will not have such a “hump” and will be easier to go over! Hammering is a good trick to use on those thick joins, but, don’t forget to use a scrap over them to protect from any residue on your hammer. Also, it’s the thing now to use the salvage as a, decorative party of the denim project. Just remember that the salvage will shrink up tighter than the cut denim edge. Using it as a long seam may end up scrunchy after a few washes. Pocket edges that get stretched make a good place for salvage use. On the denim sewing what size thread should be in the bobbin because when I use the heavy weight my machine acts up. I have a Bernina 830. Thanks so much for the bumper and needle and thread tips. Just yesterday neeed this.